Choose a page number to see the recommended websites. To see a list of the countries that took part in the war scroll down and click on "What countries fought on which side?" Scroll down to find top questions and answers about the conflict. A comprehensive introduction to an important and fascinating subject. Paul Dowswell's informative and accessible text will immerse readers in the era. Provides a genuinely international perspective, showing how people all over the world were affected by the war. Internet links to websites with movie clips, original documents, online investigations and more. I have enjoyed reading this book with my seven year old. I really enjoy learning about World War Two and am excited to have finally found a book that explains it in kid friendly terms, that gets my daughter asking questions about the war and wanting to learn more. The actual pictures from the events that took place help make it real for her. 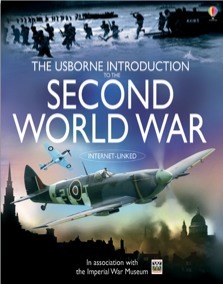 I would recommend this book to anyone young or old who wants to learn more about the second world war. I wanted to read this book because I am interested in war, and the most interesting war for me is the second world war. my favourite bit in this book is 'battle of the titans', which is about big ships and the sea battles between america and japan. i liked the picture of the aircraft carrier.